Anyone have one? I think I want to buy the 40 S&W version. Yes. I wasn’t aware the had a .40 version. Friend bought one because he could use straight walled cartridges in a rifle for deer in Ohio. I have shot it at the range. Good shooting but I doubt I would try a deer past 75 yds or so. There are many rifles chambered for handgun ammo that will do the same job. .44 mag comes to mind and the .357. The 9 and 40 should be able to use Glock mags, that way you could get 30+ rounds in a reliable magazine.. #Rugermissedtheboatyetagain. Interchangeable magazine wells for use of common Ruger® and Glock® magazines. Ships with SR-Series™ pistol magazine well installed and an additional magazine well accepting Glock® magazines is included*. Ruger American® Pistol magazine wells are available at ShopRuger.com. Kinda Meh in my opinion why shoot a pistol bullet from a rifle ? Okay maybe more accurate. Good on Ruger, you can tell Bill is dead. It never would have happened with him still at the helm. Bill ten rounds or less Ruger. It is more or less a toy that would happen to share ammunition with a pistol if mine. Was really hoping Henry would make a Big Boy in 40 by now, but have given up on that idea. The odds of a rimless handgun cartridge being made in a lever is slim. The only one I know of was a Marlin Model 62 "Levermatic" in 30 Carbine. There might be more, but I haven't seen any. I knew a guy that lost part of his hand in one of those stacked cartridge tube type guns, it was a .45 that went off in the tube for some reason. So buy the Big Boy then get a pistol to match. 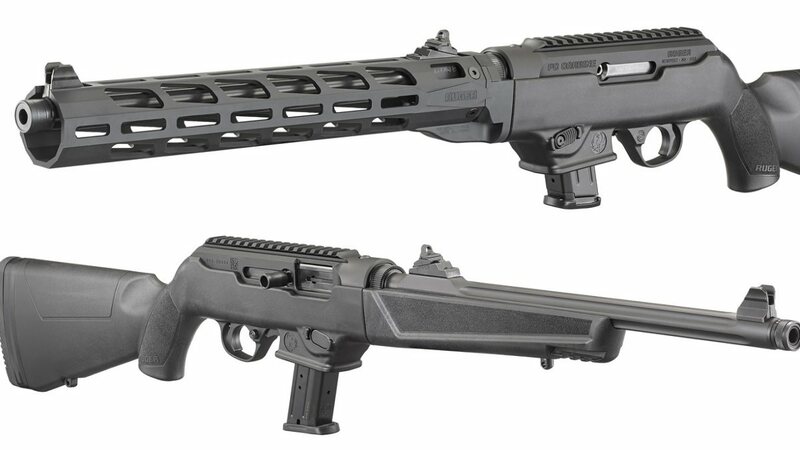 Hi Point 9mm carbine. It's ugly, but fun to shoot and pretty darn accurate. A cartridge that has ignition when not in a barrel / chamber doesn't have much Kaboom, most likely it was a chambered round failure or a firearm that fired out of battery and the easiest place for the huge amount of gas to go is down through the magazine. LOL... High Point and true accuracy will never see each other. More like it's accurate in your hands. it actually has the exact same amount of kaboom. A round that is not in a chamber is going to explode in all directions. The bullet wont go anywhere unless the pressure is directed, but the casing will turn to sharpnel. If that happens in a tube mag like the other person indicated it would likely blow the sides out of the tube and could injury the person holding the gun.